Today’s post builds on last week’s post, which focused on easing the transition to “dorm dwelling”. A universal truth about dorm dwelling is that you will be living in much tighter quarters than you are accustomed to at home, AND you will likely be required to share your tight quarters with one or more roommates. 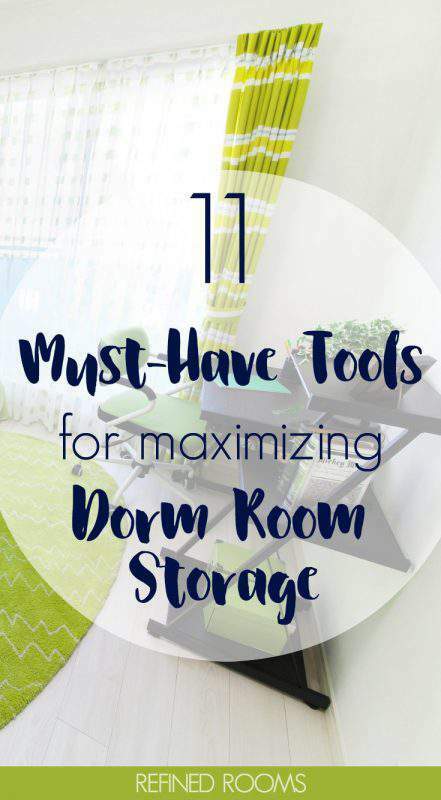 For these reasons, you’ll need to focus your efforts on maximizing dorm room storage space in your small little corner of the campus. Got a must-have dorm storage product that you would add to the list? Share it with all of us by leaving a comment! Great ideas, Natalie! I have a rolling cart in my small office with 10 drawers that fits snugly right by my desk. Perfect for students too! I lived in residence for my last year of university, and I have to say my room was fabulous. Above the desk were several large wall-mounted shelves with enough space for all my books, food, and other stuff. This should be a standard feature in all student housing! Great ideas, Natalie. Thanks for sharing at Funtastic Friday. Great tips. I like the desk hutch idea. I’ve also seen the free-standing shelving units that go around the bed. The use of vertical space in the dorm room is so important. Thanks for sharing. Ooh, I’ll have to check out those free-standing shelving units Sabrina! Hey Natalie! I thought you did a superb job on this post for dorm organization. I myself run a website that focuses on organization and time management, and a couple of the items you mentioned are actually on my site as well! Again I thought this was awesome and I would love to use this on a future resource page I’m working on. Thanks and keep up the good work!